Q: Where do you observe the most growth in real estate? A: In the Western Province, Colombo and its suburbs as the government’s Western Region Megapolis Master Plan Project includes the development of housing infrastructure. The population in the Western Province accounts for 40 percent of Sri Lanka’s GDP while disposable incomes are comparatively higher. Colombo is home to the largest number of high net worth and ultra-high net worth individuals. There is a high degree of urbanisation, generating employment and better facilities, which drives demand for housing and leads to unaffordable land prices. 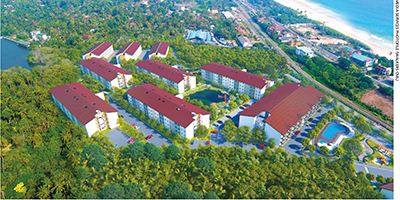 Real estate development is being driven by the planned transport infrastructure of the Western Province, government plans to transform Galle into an international tourism hub, the increasing popularity of beachfront real estate from Negombo to Matara and the Central Expressway. 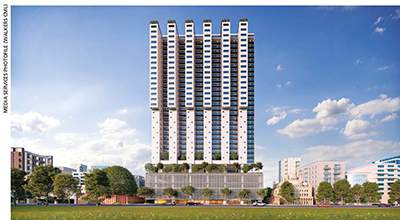 Q: Does the demand justify the boom in apartment construction especially in the luxury segment? A: The luxury segment depends on numerous factors including the appetite of local high net worth individuals who have been investing heavily in current developments. And there’s also the diaspora community and foreign investors who are buying luxury apartments. Economic growth, political stability, investor facilitation and infrastructure facilities drive demand. In the middle and lower segments, affordability of housing loans and disposable incomes drive demand. But there’s potential in the untapped diaspora community. Q: What are the latest trends or innovations in real estate? A: Integrated townships with self-contained city type property developments – with quick access to the city and containing all amenities – are growing in demand. Mixed use developments offer higher returns in the lucrative retail segment. Millennials and retirees prefer smaller spaces due to there being less maintenance and greater affordability. Therefore, modern premium condominiums offer intelligent housing systems and mechanical parking. And there are innovations in green buildings, smart buildings and energy saving properties. Buyers demand properties with lower maintenance costs. Rainwater harvesting systems are mandatory and technology – including the use of PV panels – is common. Q: So how would you describe the property market? A: It’s competitive with local firms diversifying into real estate, and foreign companies including those from China and India also investing. One time developers have created a gap in quality and led to negative criticism of the sector as a whole. Walkers CML is a pioneer in engineering and construction with the highest accreditation of CS2. It possesses unmatched know-how, and expertise in piling, structures and substructures. This enables economies of scale in mass production and the ability to obtain high quality materials at optimal prices with the ensuing savings being passed on to customers. Top consultants ensure continuous high quality, which enables us to remain competitive. We are cautious when selecting developments and locations so we build in liveable places and add value for buyers. Q: What are the main challenges that real estate companies face? A: High interest rates and borrowing costs make it unattractive for prospective buyers to purchase apartments. The government should offer a concessionary borrowing rate for first time home buyers – similar to what’s offered in India – to encourage homeownership. Rising construction costs are due to currency deflation and the use of new construction technology products. Shortage of labour leads to delays in completion. Sector regulation is required for more transparency and consistency, thereby infusing stron­ger policies to build investor confidence especially in land transactions and gaining approvals. Q: Could you outline MTD Walkers’ future plans? A: Over the years, we have become the market leader in providing affordable real estate to the middle income housing segment. Our main focus is to strengthen this position and increase market share. We hope to capitalise on this strength and extend our presence in the sector to support the government’s Megapolis plans. And we aim to collaborate with financial institutions to offer low-cost housing to cement our market leadership position. Q: How does MTD Walkers perceive the real estate sector today? A: Aligning with the government‘s main objective of increasing housing ownership in Sri Lanka, we see immense potential for building affordable housing in the middle income sector. As the demand for housing in larger cities grows, we will witness smaller apartments and mobile living as a solution to increasing housing density in overpopulated areas. Co-living or community driven housing will also emerge, and have a greater impact on demand for family friendly living with millennial buyers demanding unique experiences and services. Despite rising construction costs and unstable fiscal policies, we are optimistic about the future of Sri Lanka’s housing market and expect the sector to grow further.